I hate Christmas Cards! There I've said it, I think they are wasteful, not just money this isn't about me being a Scrooge but they are a waste of resources and the Green Hippy in me just doesn't sit well with them. Please don't get me wrong I love Christmas I love seeing family, singing carols, seeing the Christmas shows, I love every flavour and smell of Christmas food mmmmm it's so good. 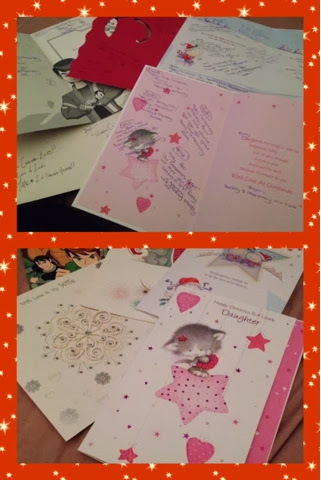 When Peanut was born we purchased cards for all of us, one each to Mum, Daddy, Husband, Wife, Daughter and now Son and another Daughter. Every year we write a new message normally relating to something the kids do or say at the time. Every year we read through previous messages and it always raises a smile in fact it always make us giggle. I love that in the years to come we have a really nice reminder of Christmases gone by and I hope the kids take this tradition into their own families in the future. What is your favourite family tradition, leave a comment and let me know. I love hearing from you all.